For me, the phrase “window shopping” conjures up thoughts of snowy sidewalks and the famed holiday window displays of New York City. Though I’ve never lived in New York, I’ve always loved to window shop, even if these days, my increasingly busy life makes it difficult to actually do so. Luckily, just as we’re rounding the corner to the holiday season, Shopilly now makes it easy for me to indulge in an exciting new form of window-shopping. Whenever I have a free moment, I find myself going back to the site to browse through my favorite brands. You can think of Shopilly as your visual inbox for everything shopping-related – great deals from your favorite brands, a history of your past purchases, receipts that you might otherwise easily misplace and – of course – a little virtual window shopping on the side. …give out whenever you are asked for an email address while shopping online or in stores. By doing this, you’ll reduce the clutter in your personal email inbox. You can also clean up your personal email inbox retroactively – simply let Shopilly automatically import emails from your other accounts into Shopilly, and you’ll see them in your Visual Inbox. Now that your inboxes are organized, begin shopping with a clean slate. Visit the Shopilly Brands tab to explore brands in categories such as Travel, Home and Beauty, just to name a few. 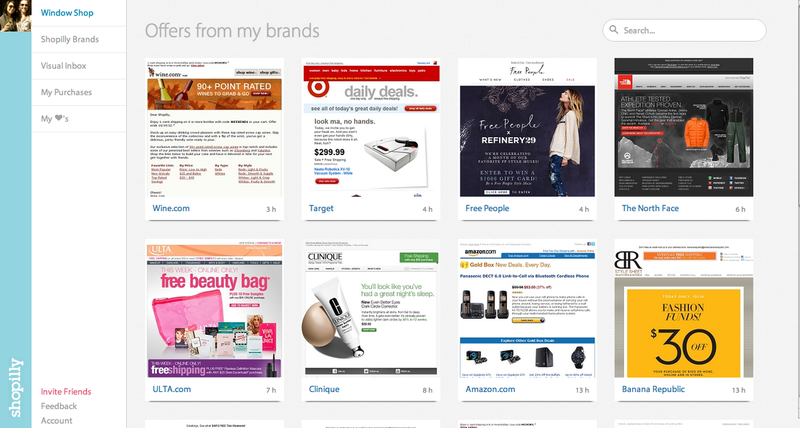 You can bookmark your favorite brands by following them. Then comes my favorite part of Shopilly – visit the Window Shop tab to view offers from your favorite brands. It’s as if you had a personal shopper bringing sales from your favorite stores right to your door! You can do all of your shopping directly from your Shopilly account, and once you’ve checked out using your Shopilly email address, your purchase(s) will appear in the My Purchases tab. There you have it – your entire shopping life transformed. But I do worry a bit – is there such a thing as a window shopaholic? What else would you like to be able to do with Shopilly? Tell us at feedback@shopilly.com. This entry was posted in Shopilly Buzz and tagged email inbox, holiday season, inbox, shopilly, Shopping, window shop, window-shopping by Xenia. Bookmark the permalink.